Future leaders: Max Tricarico, Lucas Sanders, Emma Moonie and Ruby Nelson are hopeful for their schools in 2019. 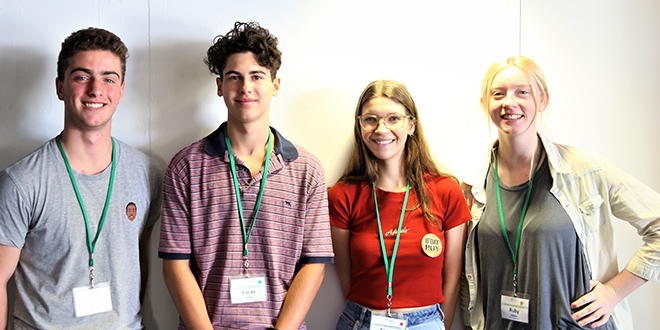 CHRISTIAN Brothers associated schools from around Australia, and one school from New Zealand, sent their finest leaders to Brisbane for a three-day intensive workshop on student leadership. 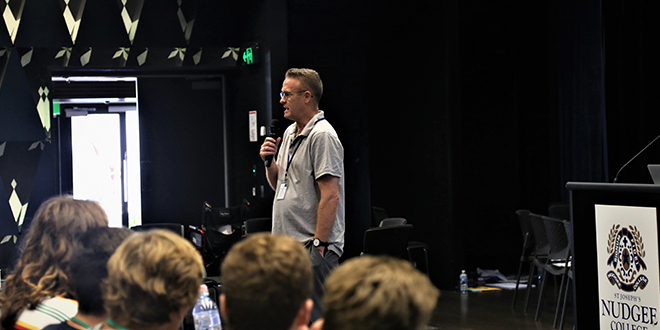 The conference, run by Edmund Rice Education Australia, brought fifty-four students together at St James, Spring Hill on Wednesday, January 16. The students spent the next two days of the conference at St Joseph’s Nudgee College. Conference organisers Mark Walsh and Ray Paxton said the conference was centred on four touchstones – Gospel spirituality, inclusive community, justice and solidarity, and liberating education. It was also about instilling hope. “The thing that struck me this morning, and Ray (Paxton) was talking about it, they’re creating speeches about their hopes for a better world for all,” Mr Walsh said. Mr Walsh said the students were aware of the world around them, of environment and diversity. “Within Catholic talk, in religious talk, we talk about the reign of the Kingdom of God and this idea of everything happening in alignment with the Gospels,” he said. Mr Paxton said a lot of the time hope was formed on school retreats and immersions but lacked a presence in the classroom. “Leaders are the prophets of hope,” Mr Paxton said. Instilling hope: Ray Paxton spoke to students about becoming ‘prophets of hope’. Many of the leaders said they were full of hope for the year to come. Paul Paul from St James College, Spring Hill said his school had a lot of people from different countries and backgrounds. He said for many of the students, everything was new in Brisbane. “We try to make them feel comfortable so they can express themselves, and if they can express themselves they can find something they’re passionate about,” he said. Paul said he had been in their position too. “When I came to the school, the leadership made me feel comfortable and made me feel like I was part of Jimmies (St James College),” he said. “And they taught me the Jimmies spirit of never giving up. Emma Moonie from Shalom College, Bundaberg said a lot of what was done in her school was about helping the homeless and those in need. “Helping people is a big thing at Shalom,” she said. Lucas Sanders from Christian Brothers College, Adelaide said he was hoping to have an impact on the culture of the school. “I want to create a better environment for learning and a place to feel free to grow and find your passions,” he said. Max Tricarico from Parade College, Melbourne said his college had 2,000 boys and with that came a lot of diversity. “A lot of different cultures and a lot of different interests,” Max said. “I’m going to work to try and get as many clubs and activities going as possible, so that students can really foster and nurture their interests as well as their academic studies. “I’m a sports person but we’re going to make a very big effort to promote all of the musical and theatre and arts too. Brayton Brown from Clairvaux MacKillop College, Upper Mt Gravatt said he’s striving to make the school a place for everyone. “I want to work with those in sport, academia, arts and make everyone want to be there for their own reasons,” he said. He said spirituality was a big part of school life. “We open every day with a prayer,” he said. Ruby Nelson from Trinity College in Colac, South Western Victoria said she had many goals for the new school year, and that she hoped she could turn those goals into a reality. When asked about the impact of social media, Ruby said she saw it as a good thing. “It’s a really progressive thing,” she said. The conference included time to learn about the First Nations people. Brisbane Turrbal elder Uncle Joe Kirk took the students on a walk on country. “That opened the eyes of a number of the young kids, especially the kids who live in Brisbane,” Mr Walsh said. EREA educational officer for Indigenous and Torres Strait Islander education Thelma Parker said one of the student leaders was from a remote Indigenous community in Western Australia. “English is not her first language,” Ms Parker said. She said the conference was about drawing on her strengths and helping her to articulate her message, so that when she goes back to her community, she’s able to spread what she has learned. “It’s also about providing that double power of both worlds, which is really important so when Indigenous and Torres Strait Islander students do go back home they become really good leaders in their own right,” she said. Mr Paxton said leadership was not about knee-jerk reactions either. “You’ve got to be evaluative, you’ve got to be analytical, and you need to understand the bigger picture as well,” he said. “The task of leaders is to develop other leaders; not to get what you want on behalf of others. This was reflected in EREA’s vision for their strategic plan. Part of the conference involved the students making a statement to camera about their vision, their hope for the coming year and for EREA. These videos will inform EREA’s strategic plan for the next five years, bringing it further in line with student needs and student visions.